The first article in this monochrome series dealt with using the TKActions V6 panel to convert color images to black-and-white. This second article looks at another important aspect of monochrome images: toning. Proper toning can enhance the mood of the image. Warm-tones, like sepia, impart a vintage look, while cooler tones communicate a more modern feel. 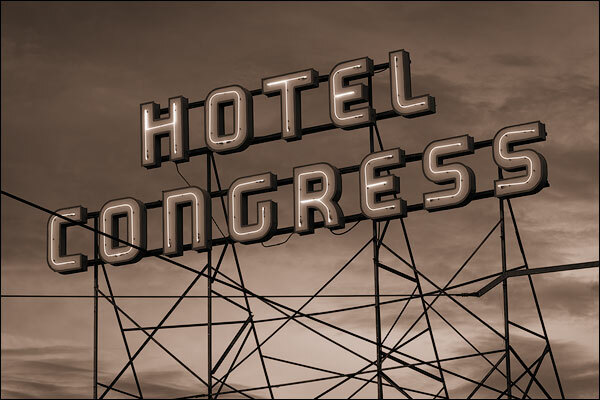 There are a variety of different ways Photoshop can be used for toning. The Solid Color and Hue/Saturation adjustment layers when combined with luminosity masks are two of my favorite methods. The video at the bottom demonstrates both techniques. Historically, toning in the darkroom was a secondary development process. After the initial development to reveal the latent image on the exposed paper, the print was immersed in another solution that would chemically react with the silver in the print to produce the toning color. The areas of the image that had more silver (the dark areas) would react more strongly with the toner. Areas with less silver (the light areas) reacted less. This is an important distinction. The entire print did NOT receive equal amounts of toning. Dark areas received more and light areas received less. Visually, this meant that light areas of the image would still retain much of their original whiteness and didn’t change color dramatically in the toner. Very dark grays and pure black toned the most, but a dark shade of any color is hard to distinguish from black, so the color change wasn’t necessarily all that visible in very dark gray and black tones of the image either. However, as the grays in the image got a little lighter and on into the midtones, the toning color became much more obvious in the print. Grays in this range showed a definite color change, but still in proportion to the amount of silver in the print. A Zone 4 gray, for example, would show more intense color than a Zone 6 gray, and this was important to maintaining the tonal separation that created the image in the first place. This concept of applying toning to the silver-rich areas of a monochrome image (the dark areas) is where luminosity masks really come in handy. The Darks-series masks do exactly this. They select dark tones in the image in proportion to how dark the tone is. The darker the tone, the more it is selected. Using Darks-series masks as part of the digital toning process simulates what happens chemically in the darkroom. However, I’ve also found Midtones-sereies masks quite useful for digital toning. Since the midtones are often where toning is most obvious in chemically-toned prints, using them in digital toning also makes sense, and the results often look good. Which mask works best depends on the image. It’s helpful to try several different luminosity masks to find the best one. One more corollary to all this is that the best monochrome images for toning generally have some good gray midtones. Images with strong contrast where most tones approach black and white won’t show the toning color as well as images that have a lot of gray midtone values. As described above, toning was a chemical process that was strongest in the silver-rich parts of monochrome images. The effect is generally most obvious in the dark and midtone grays. The whites are largely unaffected due to their lack of precipitated silver. Tinting, on the other hand, can be thought of as a staining process that affects the entire image, not specific tones. With tinting, it’s the print substrate (the paper or emulsion) that is experiencing the color change. The midtone grays will still exhibit the color change, but so will the image’s whites. Both toning and tinting are ways to add color to the monochrome image, and in the digital darkroom, it’s possible to specifically target light tones as well as the darks and midtones. So in the digital realm, the distinction between toning and tinting is a bit less clear as it was in the traditional darkroom. One distinguishing characteristic is whether the color is applied uniformly across the image (tinting) or whether it’s restricted to specific tones (toning). The Photo Filter adjustment layer, for example, tends to be more of a tinting technique since it’s applied evenly across most tones in the image. For toning, Solid Color and Hue/Saturation adjustments tend to work best. 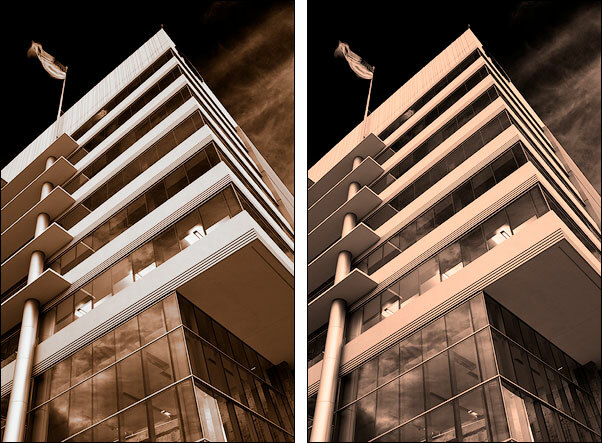 The left image below shows toning accomplished with a Hue/Sat adjustment layer and a luminosity mask. The image on the right is a tinted image made with a Photo Filter adjustment layer. Additionally, toning should be proportional within the selected tones where it is applied. The more selected tones should exhibit the most color change which then tapers off in tones that are less selected. Again, this is where luminosity masks really shine as they are able to isolate the color to specific tones in the image and in proportion to how much each tone is selected. Using the “Color” blending mode for the adjustment layer that adds the toning color is an additional technique that makes digital toning work well. It’s actually essential when using a Solid Color adjustment layer for toning, where it makes for a very nice toning effect when combined with a luminosity mask. It also provides a bit of a contrast boost when a Hue/Saturation adjustment layer is used for toning, so it’s definitely worth trying. Summary: Toning is a way to add color and mood to black and white images. Solid Color and Hue/Saturation adjustment layers in combination with luminosity masks are a great way to digitally tone photographs that mimic the traditional darkroom process. The video below demonstrates two good methods for using luminosity masks and adjustment layers to make digital toning easy and natural-looking with plenty of options for customizing the effect. If you want to practice along with the video, jpeg versions of images can be downloaded here. NOTE: With the release of CC 2019 in October 2018, there is a blending mode bug on Windows computers. It can cause the wrong toning colors to appear and can also cause PS to crash. The workaround to fix this is to go to Preferences > Performance and make sure there is a check mark in the checkbox for “Legacy Compositing.” This post has more information about this bug and its current status. Monochrome is at the heart of the photography. Early photographs had one color, black (from precipitated silver), and, in combination with a lighter printing substrate (a copper plate initially, but eventually paper), created the classic black and white look that was the signature of photography. Monochrome images have evolved significantly since their origin in the 1800s, but they’re still widely appreciated and are a great way to interpret and view the light captured by a camera. 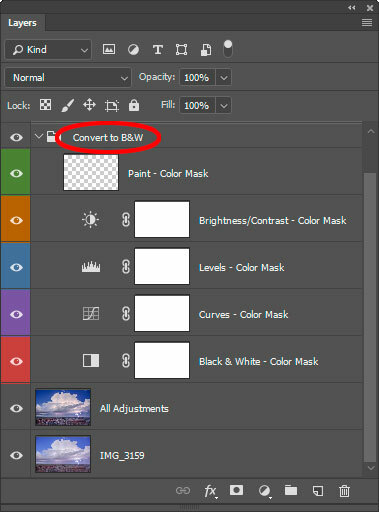 Masks in Photoshop are monochrome (black, white, and gray) by default. Luminosity masks opened the door to pixel-based masks where the monochrome tones in the mask have a direct correlation to the underlying luminance values in the image. Luminosity masks are not blobs of paint applied with a paintbrush run by a mouse. Their pixel-based nature means that the image itself can always be seen in the mask, at least to some degree. So there’s a definite connection between a luminosity mask and the image. And once you start working with luminosity masks, it’s hard not to notice that some of them could make good black and white images on their own. As I coded the TKActions V5 and V6 panels, I made sure to include the option of utilizing masks as actual images. You never know when a surprisingly good mask (or at least interesting one) might show up, and only then realize that a monochrome interpretation of the image might be worth exploring. The V6 panel makes this easy to do with dedicated output options that preserve promising masks. The panel essentially functions as a color to black and white converter in this situation. While this isn’t the primary use of either luminosity masks or the panel, it does provide a convenient method to start experimenting with monochrome since the RapidMask2 module can quickly generate so many different masks. This article will focus on ways to use the luminosity masks generated by the V6 RapidMask2 module as the starting point for great black and white images. The “Layer” button of the RapidMask2 module has a menu item for creating a pixel layer from the Rapid Mask. It’s called “Mask To Pixels” and is a direct 16-bit conversion from Rapid Mask to pixel layer in RGB Color mode. No image quality is lost in the process. The 16-bit pixel layer is an exact duplicate of the 16-bit Rapid Mask since there is no intervening 8-bit selection involved. If the intention is to purposely convert the image to monochrome using the RapidMask2 module, it’s usually best to start with one of the “Lights” masks. Then you can optionally use the MODIFY section to further adjust the mask in order to optimize it before triggering the pixel layer output. In the cactus blossom image below, a Lights-1 mask was modified with a Levels adjustment to produce the final conversion. One rather interesting way to use the “Mask To Pixels” option is with Zone masks. Zone masks are narrow slices of the tonal spectrum, but they’re still monochrome, and they are calculated to have smooth blending into adjacent tones. So there is a smooth tonal gradation as they transition from lighter grays of selected pixels to dark grays and eventually to black for unselected pixels. 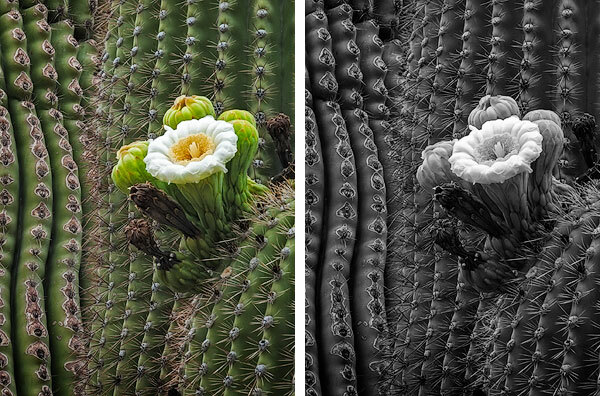 For simple compositions, like the cactus blossom shown here, try different zone masks or combinations of zone masks. 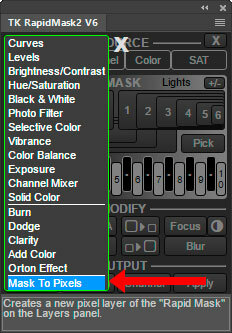 Then use the “Auto” button in the MODIFY section of the RapidMask2 module to normalize the mask so that it has a full tonal spectrum from black to white. This can lead to some slightly more abstract but appealing black and white images. The strong contrast of the “Auto” command creates a wonderful silvery quality in the narrow range of tones selected by Zone masks. This shiny effect is difficult to achieve when working with images with a wide range of tones, but when working with a narrow slice of tones, it happens quite easily. For the conversion below, I added a Zone-7 and Zone-7½ mask together, modified the result with a Levels adjustment, and then used the “Auto” option on the result to obtain the silvery shimmer in the flower. 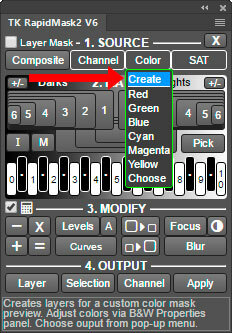 The “Create” option in the “Color” menu was intended as an easy way to make individual colors either lighter or dark in the mask that was being created. The set-up for doing this requires a few different layers on the Layers panel. 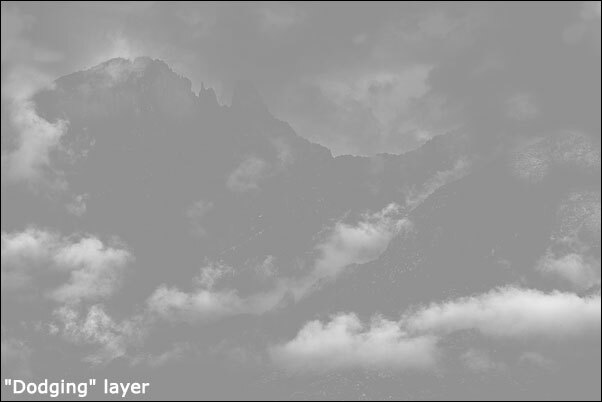 This set of layers also easily lends itself for converting images to black and white. So this “Create” option can serve a dual purpose. It can be used to create a Rapid Mask, which is output using the “Rapid Mask” button on the panel, or it can be used to convert an image to monochrome, in which case the correct output choice is the “B&W” button. The “B&W” option keeps the layers used to create the mask intact and simply renames the group that contains them. This provides a completely non-destructive way to do the conversion. At any future time, it’s possible to tweak the conversion by returning to these layers and making additional adjustments. Below is a color image and its black and white conversion using the Color > Create option. 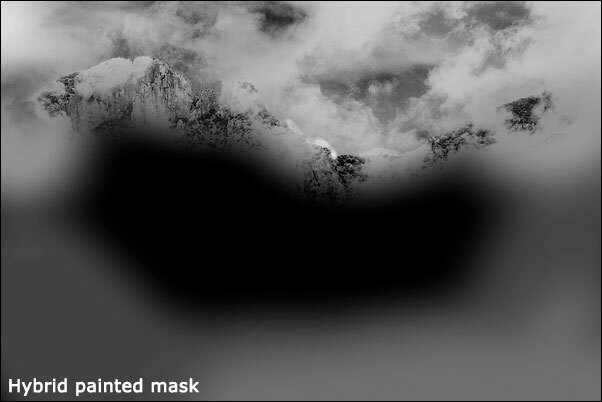 Summary: Luminosity masks, because they are based on pixel-level data, embed the actual image in some manner in the mask. And because masks are always monochrome, luminosity masks have the potential to be a conversion tool for creating black and white images from color files. 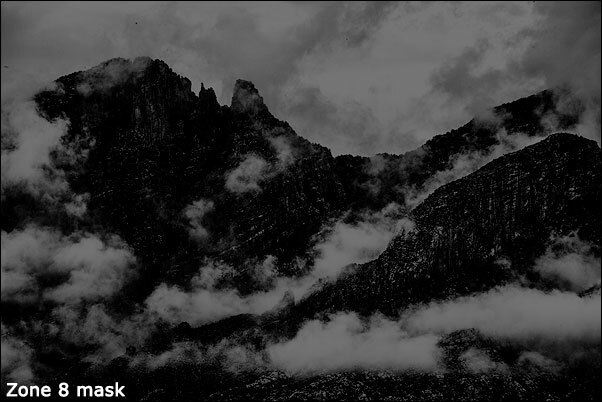 The TKActions V6 panel includes dedicated output options (“Mask To Pixels” and Color > Create) for using luminosity masks as actual black and white images. The video below demonstrates these techniques. NOTE: Converting a color image to monochrome is usually not the same as actually finishing it. After converting to monochrome, most images will still require additional processing to achieve their best potential as a black and white photograph. Being mostly a Nature photographer producing color images, I occasionally get questions about the applicability of luminosity masks to other genres such as portraits, wildlife, autos, and black and white. I always respond that luminosity masks work equally well on any continuous-tone image regardless of the subject. Luminosity masks select specific tonal ranges in the image, and since all photographs are composed of tones, they all can use luminosity masks to adjust these tones. It’s just a matter of finding a way to select the desired tones and then making the necessary adjustment. I did a basic conversion to black and white in Adobe Camera Raw and then brought the image into Photoshop where I did the rest of the processing with luminosity masks. There were three adjustments that made the biggest difference for this image. The first was a luminosity painting layer. I wanted to improve the cloud texture and enhance the contrast between the clouds and the background in the lower part of the image. To do this I made a new layer, filled it with 50% gray, and changed the blending mode to Overlay. 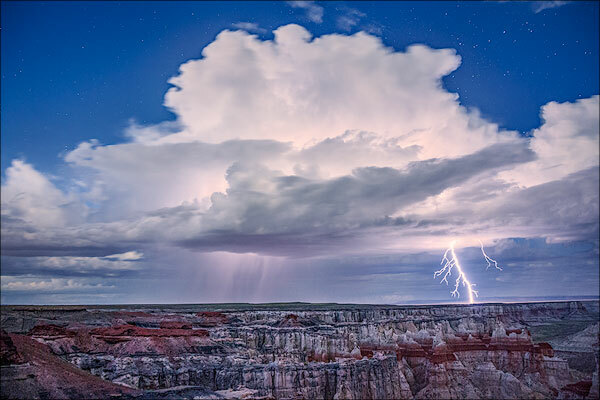 This became the “Dodge” layer for selectively lightening the clouds. Brushing white paint onto this layer has the effect of lightening anything on the layers below. 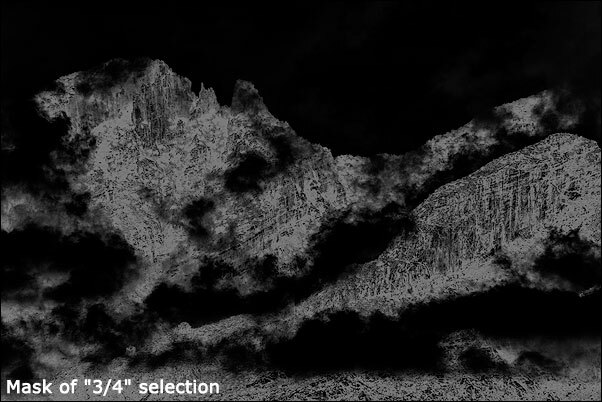 In order to target just the clouds, a Zone 8 luminosity selection was created (mask shown below). It selects the tones in the clouds (lighter areas) without selecting the non-cloud parts of the image (darker areas). As I painted through this selection, the clouds (lighter areas) received white paint and are lightened, but the adjacent non-cloud (dark) areas receive no paint and remain unaffected. The Zone 8 selection guides the paint onto the layer so that it is perfectly applied to lighten the clouds without spilling onto the non-cloud areas. The effect this has on the image is shown in the before and after (rollover) images below. The “Dodge” layer is reproduced below. It shows that the Zone 8 selection was extremely precise in depositing paint exactly where it was needed. Even the delicate fringes of the clouds are properly painted without straying onto the mountains behind. Luminosity painting through a luminosity selection can provide this “automatic accuracy” when burning and dodging. In addition, the effect can be built up to the degree that looks right for the image by varying brush opacity and applying multiple brushstrokes. So it’s highly customizable and the results often look completely natural. A second technique that helped this image involves the use of a quarter-tone mask. These are narrow tonal range selections that have their midpoints near the quarter tones of the image. The highlight quarter tones selection peaks around a gray value of 200 and the shadow quarter tones selection around 56. These are off-center midtone selections, so they aren’t locked into the lightest or darkest tones in the image. They feather tonally into both lighter and darker tones and their use is often accompanied by a favorable contrast change. In this case, the shadow quarter tone mask (which I refer to as “3/4”) was used on a Curves adjustment layer. The layer’s blending mode was changed to Multiply, which darkens the image. This 3/4 mask served as the layer mask and controlled which parts were darkened. It is shown below. The before and after (rollover) images for the change provided by this layer is shown below. It’s subtle, but the adjustment definitely strengthens the darker parts of the mountain without dragging down the highlights. When I want to do selective tonal lightening or darkening of an image, these quarter-tone masks combined with either Screen (to lighten) or Multiply (to darken) blending mode are something I try because it often produces a pleasing result. I actually find using the Screen and Multiply blending modes effective in many situations where a luminosity mask is the layer mask on a Curves or Levels adjustment layer. Instead of bending a curve or positioning a slider in this set-up, the layer’s opacity is simply adjusted to achieve the desired effect. The last adjustment that made a significant difference to this image is one where I’m not entirely sure what I did. It involves a Curves adjustment layer set to Multiply blending mode, so it was another darkening adjustment. The adjustment was selectively applied through what appears to be some type of hybrid painting technique of the mask. In this case, a hide-all (black) mask would have had white paint brushed on to reveal the darkening adjustment of the layer. The painted mask is shown below. A luminosity selection was obviously painted through to reveal of the sky and the tops of the mountains since the outline of these are clearly visible. But there is also some painting around the lower edges that appears to been performed with no active selection. I don’t recall exactly what was done and have been unable to duplicate it. Despite the uncertainty of exactly how it as accomplished, this adjustment did a nice job of strengthening the sky texture and providing better overall tonal balance between the clouds in the sky and the mountains. The before and after (rollover) images are shown below. This last adjustment shows that there is a certain degree of spontaneity in using luminosity masks. Not every adjustment requires just one mask or one way of using that mask. The photographer responds to what the image needs and selects the tools they wish to use to accomplish the desired goal. It’s important to not get locked into thinking that there is one mask that will make everything perfect. Luminosity masks are simply tools that can be used in multiple ways. There is no prescribed path and experimentation is always an option. They offer a versatile tool set for working with tones in all types of images. A small PSD file of this image showing the entire workflow can be downloaded at the bottom of this page.